“Fascism Today looks at the changing world of the far right in Donald Trump’s America. Examining the modern fascist movement’s various strains, Shane Burley has written an accessible primer about what its adherents believe, how they organize, and what future they have in the United States. The ascension of Trump has introduced a whole new vocabulary into our political lexicon—white nationalism, race realism, Identitarianism, and a slew of others. Burley breaks it all down. From the tech-savvy trolls of the alt-right to esoteric Aryan mystics, from full-fledged Nazis to well-groomed neofascists like Richard Spencer, he shows how these racists and authoritarians have reinvented themselves in order to recruit new members and grow. Lyons: Fascism Today packs in a lot of detail about a lot of different political organizations and scenes and individuals. How did you go about doing the research for this book and how long did it take you? Burley: I would have to say it took me seven years, but that is not when formal research began. Instead, this was me trying to grasp a change that was happening. Back in 2010, there was a flurry of far-right activity happening in Upstate New York, where I was living. At this point the insurgent right-wing movement close to the GOP was the Tea Party, using weaponized Americana to push for aggressive libertarian economics and traditionalist conservatism similar to the evangelical “Moral Majority.” At the same time, there was a dissident movement growing on the edges of paleoconservatism, libertarianism, and other fragments of those to the right of the seemingly “orthodox” Neoconservative Republican Party. In 2011, David Irving, the famous Holocaust Denier, had an appearance nearby, and I was trying to understand the change that was taking place inside the radical right. What I found was something more culturally and ideologically concise than we have had for years. I stumbled upon a podcast called Vanguard Radio with a young and well spoken guy interviewing Merlin Miller, a former filmmaker who had become the presidential candidate for the American Third Position Party (now the American Freedom Party). The interviewer was Richard Spencer, and Vanguard Radio was the podcast for the now-defunct AlternativeRight.com. It would be reductionist to just say that these were just “suit and tie fascists.” We have had that dynamic for years, with David Duke sprucing up the fourth-era KKK in the 1970s or American Renaissance trying to give scientific racialism an academic veneer. But this was more profound than that. Instead of simply trying to feign academia, they were really trying to create a coherent fascist ideology, to argue openly against human equality, democracy, and most of the founding post-Enlightenment ideas that even conservatives accepted. While most traditional American far-rightists focused heavily on double-speak and conspiracism (they did this as well), Spencer, and his group of misfits at AlternativeRight.com, openly advocated for a difference of underlying values. It was this focus on values, what they identified as meta-politics, is what defined the Alternative Right, and they drew on a whole fascist intellectual tradition called the European New Right that we, until that point, did not have a corollary for in the U.S. So it was at that point that I began reading the website regularly and, more importantly, listening to the podcast because it was through that conversational style that you could get the clearest statements of ideas, hear them develop over time, and begin to track their progress, organizing, and strategies. So over the years I kept up with that weekly touchstone, adding in a growing repertoire of white nationalist and Alt Right podcasts, including Counter-Currents Radio, The Daily Shoah, Fash the Nation, Start the World, Tribal Theocrat, Red Ice Radio, and others. The way they have created their own media has made it easy to monitor and track, and that is where my understanding of the Alt Right actually came from. So it took several years of monitoring before a very clear picture of who they were, where they were going, and what threat they presented formed. By that point we were hitting 2015 and they were entering the larger culture through their tactical alliance with the troll culture found on Twitter, Reddit, and the “Chans,” and I began writing it about it at that point. By the time I got to the formal outlining of Fascism Today, I already had done years of research, so at that point it was about cataloguing, arranging, fact checking, and writing. Since I am continuing to focus on this, I am continuing to keep up the research, so that I am trying to use that background to keep on top of their trends and make the information useful. Lyons: The term fascism gets used in a lot of different ways, and even just on the left, people have a lot of different ways of defining it or not defining it. I think it’s valid to talk about fascism without having a pithy one-sentence definition, but it is important to have some clarity about what we mean. And that requires a kind of balancing act. On the one hand, you need to articulate a concept of fascism that’s flexible enough to cover the diversity within far right politics and the fact that far right politics is dynamic and has changed enormously over the past century. On the other hand, you need the concept to be specific enough to be analytically useful, or else “fascism” just becomes an epithet without any real content. How do you approach this issue, and how do you frame the concept of fascism? 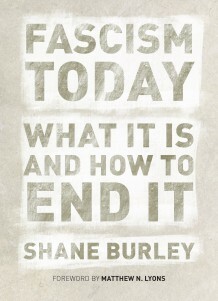 Burley: The problem with the term fascist is its heavy misuse, both as an epithet and from sincere mistakes. There are the mistakes of orthodox Marxism to frame fascism in terms of class compositions, one that misses ideological and cultural factors and the way that it morphs over time. There is also the problem of framing fascism only inside the geopolitics of interwar Europe, which essentially frames its defining features in politics that will not be repeated and necessarily makes fascism a threat of the past. I side somewhat more slightly with scholar Roger Griffin and what is often called the “new consensus” that fascism, at least ideologically, makes up a form of what Griffin termed “palingenetic ultranationalism,” a nationalism born of myth and rebirth. I go ahead and frame fascism in my book on two axes: the belief in human inequality and the violent and mythological drive towards essential identity. This defines fascism as a belief in fixed identities that are unchosen and that human beings are unequal and society needs to remain stratified. I think this is a broad categorization that covers most occurrences of fascism, both in a revolutionary movement that takes state power and for an insurgent minority movement, but it is certainly not the whole picture. It takes further examination and comparison, but it is a starting point and a foundation for seeing how these movements form from a meta-political base, the space of idea that comes before politics. When we look at the Alt Right in the U.S. or identitarianism in Europe, we see a battle for identity as an essential and fixed category, a traditionalism based on a mythic past, a violence rooted in warrior fetishism, and the fundamental belief in the need for social stratification based on a perceived natural hierarchy of human inequality. Without that, you do not have a fully formed fascist movement, but you may still have the kernels of fascism that some call proto-fascist. Lyons: On Page 247 of Fascism Today you comment that “fascism has always fed on weaknesses of the left…” Please discuss. The American left goes through many phases and takes on many competing, and often contradictory, modes of thought in an attempt to constantly reinvent a liberatory politic. In doing this, ideas are often appropriated and built that stray from its foundational principles, all in an effort to target specific areas of systemic and interpersonal oppression. A very clear example of this is found in anti-imperialist politics. In many areas of the left, alliances have been made with despotic regimes, racial nationalists, and far-right actors who, while also opposing American military hegemony, have political ideas that would make us shudder. In the support of Palestinian liberation, this has meant even allying with open anti-Semites, who place Jews at the center of a cabalistic world conspiracy and who throw doubt on the Holocaust. In an effort to center the role of international finance in global destruction, many have made these same allegiances, using anti-Semitic caricatures and conspiracy theories in an effort to drive a populist anger against the bankers. Another example of this has been in recent conversations about cultural appropriation. It has been a feature of Western colonialism to appropriate sacred items from colonized people and to use them in non-sacred ways for centuries, and today is no exception. Yet, in some of the myriad of blogs and conversations about cultural appropriation, the language and logic of ethnic cultural ownership has been used, which necessarily frames cultures and religions as having an essential nature belonging to a particular ethnic group. This cements a narrative that these cultural practices are part and parcel of ethnic groups, using the same logic that the European New Right does that culture is the manifestation of the spiritual and bio-psychological qualities of a particular “people.” To challenge these sorts of creeping narratives the left does not have to abandon those areas of struggle, but instead to clarify terms and strategies. You can oppose the careless appropriation of cultural artifacts without laying down nationalist arguments to do it. The same is true of issues like imperialism, gentrification, and international solidarity. Clarity in ideas and organizing provide this, and understanding the underlying ideological assumptions of fascism can help to develop this clarity and consistency. Lyons: One of the things that impressed me about Fascism Today is how you talk about antifascism as a multifaceted movement, and about the need to create space for a range of antifascist strategies and political visions. I think this is related to one of the themes that’s central to Three Way Fight as a blog and as a political current, the idea that we need to combat fascist and far right political forces, and we also need to combat the established economic, social, and political order that fascism is rooted in but also genuinely at odds with. Please talk about your vision of antifascism as a multifaceted movement and how that relates to the three-way fight approach. Burley: One of the things I describe in Fascism Today is what has been coined “mass movement antifascism,” which really just means an approach to antifascism that finds a place for the mass of people. Fascism itself is a mass politic, one that could not have existed in an era before mass participation in politics. If it is growing at a quick speed, beyond just insurgent violence threatened by neo-Nazi skinheads or the KKK, then antifascists can see a need for a mass response. What this can mean is that the conception antifascist resistance can be expanded to find a place for everyone who wants to participate. One of the things I did in the second half of the book is to survey different approaches to antifascism, choices made on an axis of interest, access, location, skill set, and other dynamics. How do you approach the rightward creep in rural areas? How about communities that are under threat and want community support and defense systems? What about using existing structures of struggle, like labor unions? What about confronting fascist entryism into cultural institutions that you are already a part of, like a church or religious congregation? All of these areas provide different advantages and will attract different constituencies, and if they are tied together into a coalition whole then you have a large mass antifascist movement that takes on the struggle in multiple venues simultaneously. What mass movement antifascism is not proposing, however, is to abandon other existing types of antifascist organizations, and certainly not to abandon militant antifascism. Instead it is actually just to build on what is there, add to it and find new ways of engaging the public and finding new platforms for resistance. If antifascists are not able to communicate with and find use of large masses of interested people, then they lose the ability to educate and transform the public along with the struggle. At the same time, a mass movement can achieve what a small cadre cannot. An example of this was the recent set of antifascist mass actions in the wake of the Charlottesville disaster. In Boston, Alt Right groups were attempting to hold a public rally, including about 150 of their people. They were met by 40,000 opponents, some who were organizing antifascists and some who were community supporters who had never mobilized before. They shut down the event by challenging it through their numbers, and went even further, having a mass public action against fascism and the Trump administration. This has the potential of radicalizing a whole new mass constituency, getting them involved in ongoing projects, yet maintains the same tactical edge that antifascists wanted, namely to confront the fascists directly and disallow them space. What will be important, however, is to create good working relationships between groups, and to make sure that people, no matter what organizational approach they choose, understand why militant antifascism has been taken up and the important history it has had. The other component of this resistance is to see it as a gateway to larger struggles about the issues that run underneath a fascist insurgency. Most people find Nazism abhorrent, but do they feel the same way about racist police violence or systemic inequality? Antifascism is a point of rupture in their feelings of normalcy, and this can be an opportunity to create entry into the larger work of dismantling white supremacy and hierarchical foundations. Fascism is the violent inequality of society moving from the implicit to the explicit, and it will continue to return unless that implicit element is addressed and demolished. In a follow-up post, Shane Burley will interview Matthew N. Lyons.